Mint chip is our favorite flavor. 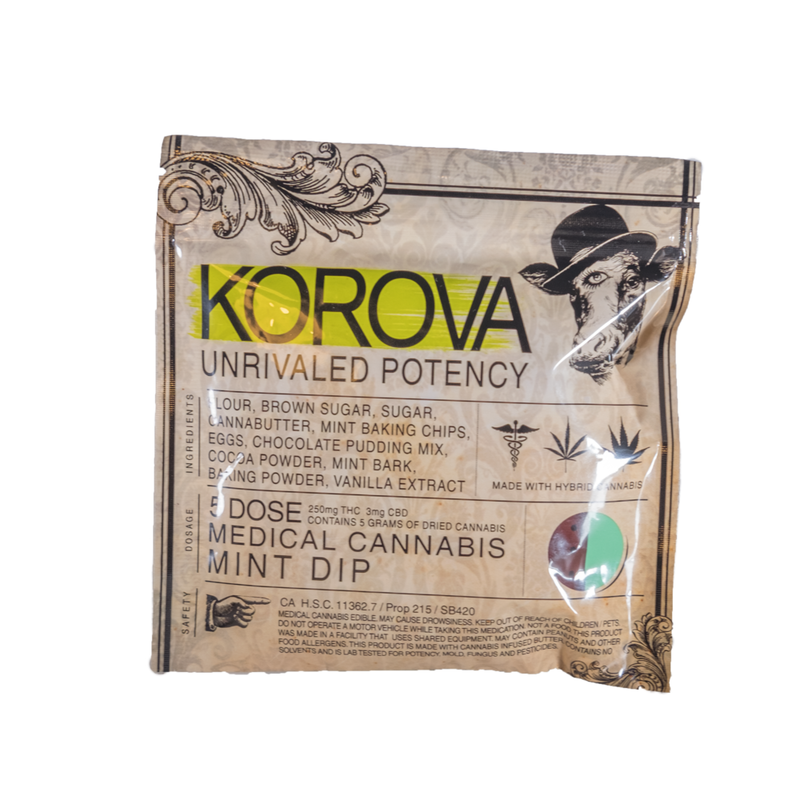 Wholesome ingredients plus really good canna butter makes Korva's baked goods some of the strongest, and most decadent edibles on the market. Korva started as a company dedicated to helping people with medical conditions that required stronger dose edibles. They market their products under the term “Unrivaled Potency” to underline these are super-strong-not-for-beginner edibles. The cookie we reviewed had 250 mg of THC in it, which is roughly the equivalent to 5 grams of cannabis flowers. So, only eat 1/5 at a time. Seriously. Or, be prepared if you dare to try more. The Mint Dip cookie we tried was a tasty dose of flavor. It was a double chocolate chip cookie with crème de menthe chips and dipped in gourmet mint chocolate. It tasted like mint chocolate chip ice cream (our favorite), plus looked and smelled great. Supposedly, Korova uses chocolate pudding mix in the recipe, so the cannabutter-based medicine was barley noticeable. In other words, for how much cannabis this cookie has in it, it still doesn’t taste anything like cannabis. Our recommendation is find 5-6 friends, cut up the cookie, and savor your piece. Then everybody hit the couch, and set a timer for at least 120 minutes before trying more.